In an unusual set of circumstances, play during the Specsavers County Championship Division One four-day match between Essex and Lancashire at Old Trafford, Manchester was temporarily halted. 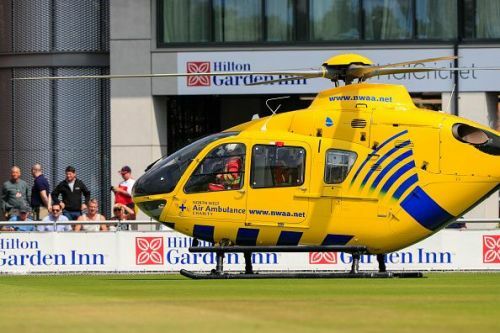 A medical emergency deemed that the match be put to a pause, as the air ambulance landed on the outfield to tend to a spectator in the crowd who had suffered a health affliction during the course of the match. It was a commendable effort on the behalf of the stadium administrators to be so concerned about the spectator in the crowd, the best available measure was resorted to and the right thing was done by stalling the on-field action to execute the priorities appropriately. The delay lasted a healthy twenty-seven minutes as the victim of the unexpected ailment was carried to the aircraft and evacuated in the quickest of possible times to be taken to the nearest medical facility for further treatment. In the on-field proceedings, Lancashire and Essex, both placed in the midst of the points table were at even positions after the conclusion of the first innings of both the sides, having been all-out for 301 and 302 respectively. In Essex's dig, Alastair Cook found some respite after a run of low scores in international cricket as he scored a patient 58 at the top of the order. Australia's Joe Mennie, who featured in the disastrous loss at Hobart in 2016 as his first and so far the only test, picked three wickets. However, Lancashire fell apart in the second innings and at the time of writing, their seventh wicket fell at the expense of just 47 runs on the board. Essex's opening bowler Jamie Porter picked four wickets in a frenzied collapse of Lancashire as the recently recalled Test opener Keaton Jennings had to go through the unfortunate event of bagging a pair.